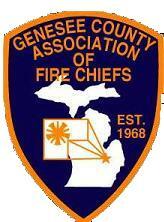 Home In 1971 the Genesee County Firefighters Association started awarding members of Association Departments the County Firefighter of the Year Award. When the association was disbanded in 2002 so was the award. Under President Bob Cairnduff this award has returned after 10 years and will be presented on behalf of the Genesee County Association of Fire Chiefs at the 2012 Installation of Officers Banquet. For a complete list of all the previous FFOY recipients, CLICK HERE. This page was last updated on April 04, 2019 at 11:27.